Giani Puran Singh, who was removed as the Head Granthi today, refused to accept 'siropa' (robe of honour) from his probable successor, Giani Gurbachan Singh, at the sanctum sanctorum. Akalis and Congressmen have started warming up for the Ajnala byelection scheduled to be held on February 23. This Assembly constituency was declared vacant following the election of Dr Rattan Singh, who represented it in the state Assembly as an Akali MLA, to the Lok Sabha last year. The conferences of the Shiromani Akali Dal (SAD) and the Congress, organised to mark Maghi Mela, here today turned out to be flop shows in the absence of star speakers of both parties. While SAD president Parkash Singh Badal and his son Sukhbir had to attend court hearing, PPCC president H.S. Hanspal could not make it due to a meeting with Congress president Sonia Gandhi. On the fourth and concluding day of the Maghi Mela, which is held every year to mark the supreme sacrifices made by 40 muktas, a sports and cultural festival was organised here today. The Gurdwara Election Commission continues to receive little support from Congress governments both at the centre and in the state. Though two Deputy Commissioners were recently transferred on the Commission’s recommendations, precious little has so far been done to amend Gurdwara Committee Election Rules of 1959. Under its most daring and much- delayed demolish operation, the municipal corporation today pulled down scores of illegal buildings and structures that had come along the erstwhile “nahar” and reclaimed prime government land worth more than Rs 50 crore. 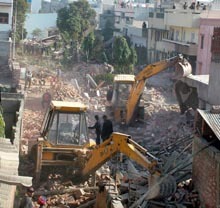 An MC demolition squad pulls down illegal structures along the “purani nahar” in Jalandhar on Friday. — Photo by S.S Chopra. Differing with the Punjab Finance Minister over the proposed privatisation of the PSEB, Mr Raman Bhalla, member(Administration) of the board, today said that the state government was not in favour of privatisation. Hundreds of government employees in Punjab continue to suffer as they have not been paid salaries for the past over two months. The salaries of these employees working in various departments have been stopped because of the indifferent attitude of their superiors in completing the required official formalities. The Punjab Government has appointed Mr Rahul Gupta and Mr Sukhjit Pal Singh to the Punjab Civil Service (Executive Branch). Both were in the 1999 batch of the Punjab Civil Service which had been selected by the Punjab Public Service Commission headed by Mr Ravi Sidhu. Tiwari Model Senior School, vice-president of the Tripari Punjab Youth Congress, Mr Rajnish Shori and president of the District Youth Congress, Mr Sanjeev Sharma today donated Rs 35,000 to the Rajiv Gandhi Welfare Relief Trust and Rs 5,000 to the Prime Minister’s Relief Fund for the people devastated by tsunami in coastal areas of the country. The local units of the BJP and the RSS on Wednesday collected funds for tsunami affected. They went door to door in the main market and collected money by demanding Lohri from shopkeepers. The Punjab Tourism Development Corporation after having wound its operations in other parts of the country, is in the final stages of closure in Punjab also. As part on the ongoing proceedings, the corporation has offered voluntary retirement scheme to all its employees and officials after collecting details about their property. Out of 219 sanctioned posts of medical officer in Ferozepore, District, more than 107 posts of medical officer and many posts of paramedical staff were lying vacant, according to Dr Birander Paul Singh, Civil Surgeon. He was talking to The Tribune at the closing ceremony of a free eye camp organised by the Dairy Union and Friends Club here yesterday. The alleged picking up of a former police informer from his Daultpuri locality house yesterday by the Jalandhar police and not showing him as duly arrested has kicked up a row, with the police maintaining that the accused had run away, while leaving behind four 100 gm packets of smack after being signalled to stop at a naka near the PAP complex here. Sunil Mehta was allegedly picked up by a police team from his Daulatpuri locality residence in the wee hours, sources said. The police has effected the arrest of Gurwinder Singh Samra, presently in the judicial custody, in four criminal cases registered against him about two years back. 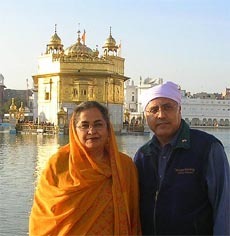 According to the police, these criminal cases were registered against him under Sections 420 and 406 of the IPC for cheating and criminal breach of trust on the complaints of Darshan Singh of Kamalke village in Moga, Jagir Kaur of Mokel village in Bhogpur, Balwinder Singh of Daulewala village in Zira and Paramjit Singh of Bhushan Shah Basti in Jalalabad. The Lok Bhalai Party (LBP) today came out against what it termed as “open loot” at three toll tax barriers on the Ludhiana-Delhi road and announced to hold a conference at the Doraha barrier on February 5 to sensitize common man on the issue. The party president, Mr Balwant Singh Ramoowalia, made this announcement at the party’s conference on the occasion of Maghi Mela here. Flying restarted today at the Jalandhar Flying Club which is housed in the aviation field here after a direction to this effect by Punjab Civil Aviation Director Rakesh Chandra. A youth was murdered with a sword and his mother and brother received serious injuries during a brawl at Mundi village of Bhulath late last evening. While the youth, Makha, succumbed to injuries at Maqsoodan Hospital in Jalandhar last night, the mother, Ms Jasvir Kaur, and brother, Swaran Singh, are still admitted to Begowal Civil Hospital. Joginder Singh (45) and Jaswinder Singh (38), both sons of Mr Dalbir Singh of Monak village, died on the spot when the motor cycle (PB-21A-8102) on which they were going from Mukerian to their village, was hit by a jeep (DL-3C-411) today. Both were employees of a sugar mill. The police has been deployed to avert a clash between two factions of teachers and students over the transfer of a maths teacher at Government Elementary School in Government Seed Farm Colony early this week. The colony which is inhabited by tenants has a separate panchayat. Dr S.S. Johal, Deputy Chairman, Planning Commission, Punjab, has said courses of study and the syllabi of the universities of the state should be as per the requirement of the international market. The Punjabi University Dean Academic, Dr S.P.S. Virdi, today exhorted the NSS volunteers and programme officers to dedicate their efforts towards social service, AIDS awareness, environmental programmes and women empowerment. Milkfed, Punjab, will export milk products worth Rs. 15 crore to the Arab countries in the current year against the export of milk products worth Rs 12 crore in 2004.